The Governor of Bayelsa State, Mr. Seriake Dickson, has ordered the immediate payment of teachers in the state. He said the government had released N540m to pay their two months salaries in line with the ongoing 50 per cent salary payment agreement with labour, a Government House statement said on Sunday. The governor called on striking teachers to resume duty, stressing that his administration had resolved to give priority to address the welfare and conditions of service of teachers. 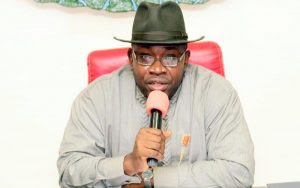 Dickson was quoted as giving the assurance at a special interactive meeting with principals and vice principals of all public secondary schools in the state at the DSP Alamieyeseigha Banquet Hall in the Government House, Yenagoa.